I’ve traveled past Crystal Lake, located in the towns of Ellington and Stafford, CT, many times on my way to Stafford Springs and Ashford, and I have admired the lake from the hills off of Sandy Beach Road at a housing development where I’ve done some landscape designs as well. But my recent passion for this lake has grown since I’ve glided over its smooth waters on tranquil mornings during of my off-time on my new kayak. Crystal Lake is perfect for beginners, such as myself, because it is not too big, nor too small (FYI, a website indicates the lake area is 183 acres). I’ve tour the lake within an hour or so. However, paddling back to return to the public access boat launch is not always easy because I usually don’t want to leave. I describe kayaking like, “getting a massage.” The calm mornings, the sounds of wildlife, and the feeling of being relaxed as nature surrounds you, is part of the kayaking experience for me. It has become an addictive hobby, and it turns out to be a great way to see plant life up close and personal. Occasionally, a fish may splash in the water, or birds will fly overhead to land on plant life nearby. You may even have a pack of geese following your kayak, which happened to me one morning. Most of the waters in Crystal Lake are crystal and clear, but there are some areas of the lake tucked in near a dam, and in cove nooks where water spots are low, filled with plant life. Plant growth and mucky swamp like waters exists in these side areas, and it is not a suitable swimming area, but a kayak can find its way carefully to adventure close by, should you not mind a bit of muck smell and bugs. 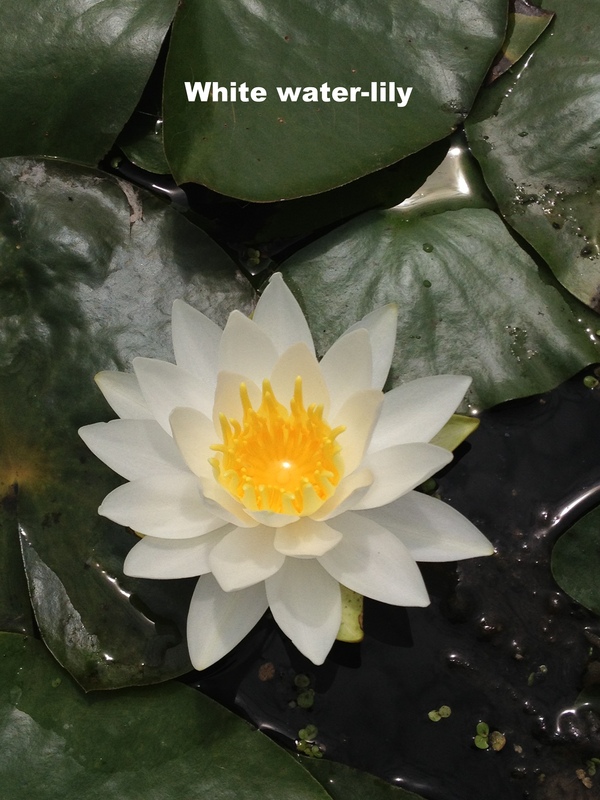 The lure of lily pad blooms drew me into the area. I wanted to get some up-close shots of blooms. The pond like area was a quieter section of the lake because it is surrounded by trees and part of inner nooks, and the birds were chirping and perching on plant life everywhere. As I carefully paddled nearby, it did cross my mind to be careful to not collect any plant parts or plant drippings on my paddles and to use caution, not only for myself (because this is a place you do not want to tip over your kayak), but because there was a lot of foliage and silt moving around me, and I wondered if this could be disturbing the plant live too much. It occurred to me maybe I was breaking a rule. On my way through some of the water plants, I discovered some rather bizarre looking insects. They didn’t seem to notice me at all as I took a few close up shots. They sat perfectly still on top of a lily pad. As I took the photo, I was thinking when I return home, researching these plants and the lake online was my priority to educate myself more. I left a message with the Crystal Lake Association to obtain more information, because certainly as a plant person, I didn’t want to contribute to the spread of an invasive species. 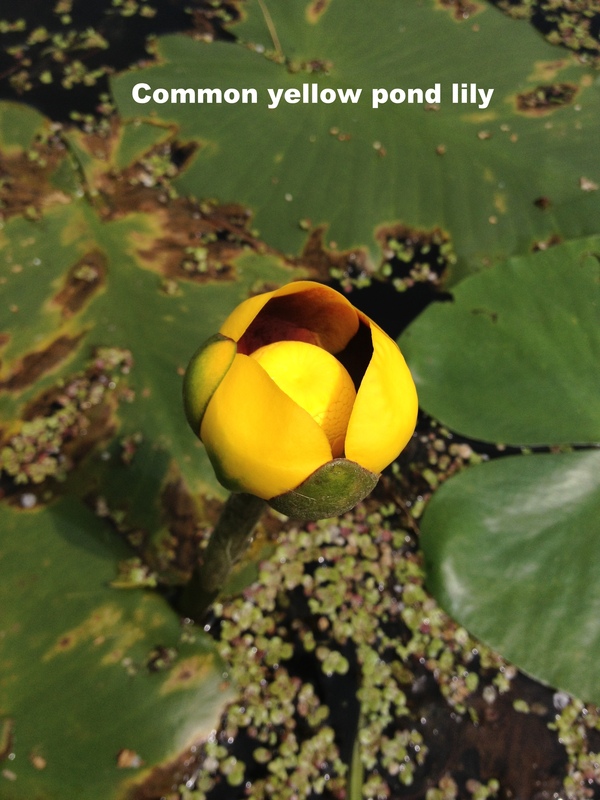 There were two types of blooms happening, one was a white water-lily and the other, yellow pond lilies. In researching websites, I believe they are Nymphaea odorata (American white water-lily) and Nuphar variegata (Common yellow pond lily). Without my kayak, getting close up shots would be near impossible. 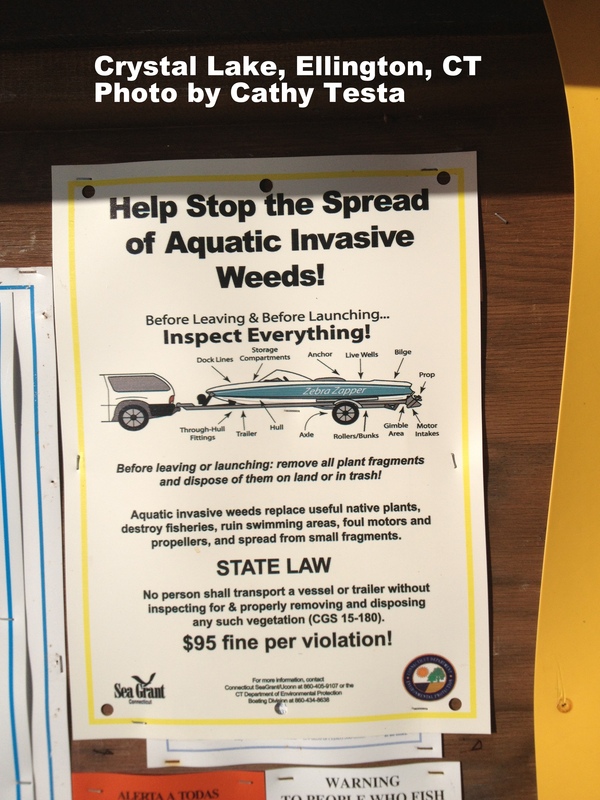 When I left that day, I read the poster by the public boat launch warning boaters to not bring invasive species plant parts along with them on their boats or equipment. My mission is to find out more about how the area is protected. Because the lake is so beautiful everywhere else, this has to be a priority, and my guilt has not yet subsided for venturing into the lily pad area to take photos. When you go to the lake, you can find the public access road off Rt 30. 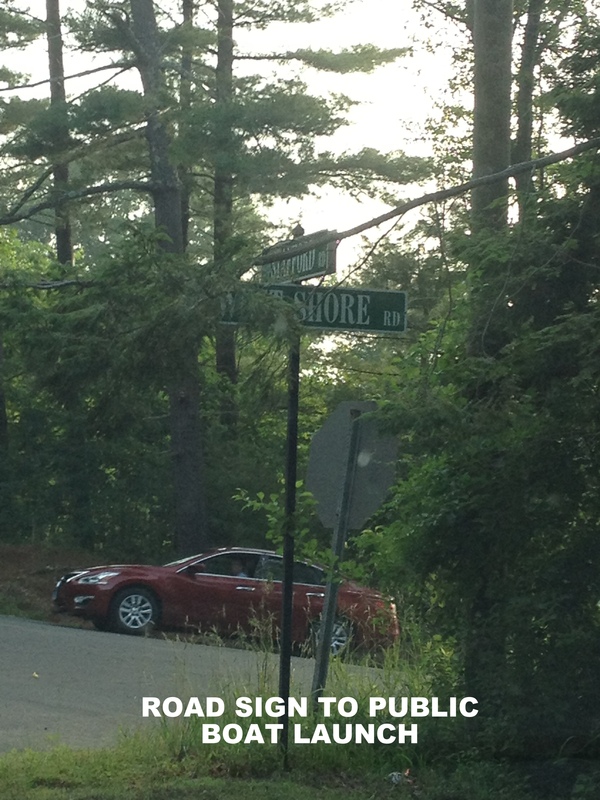 Finding the street sign can be a challenge one way as a big tree is hiding part of the sign for West Shore Road. 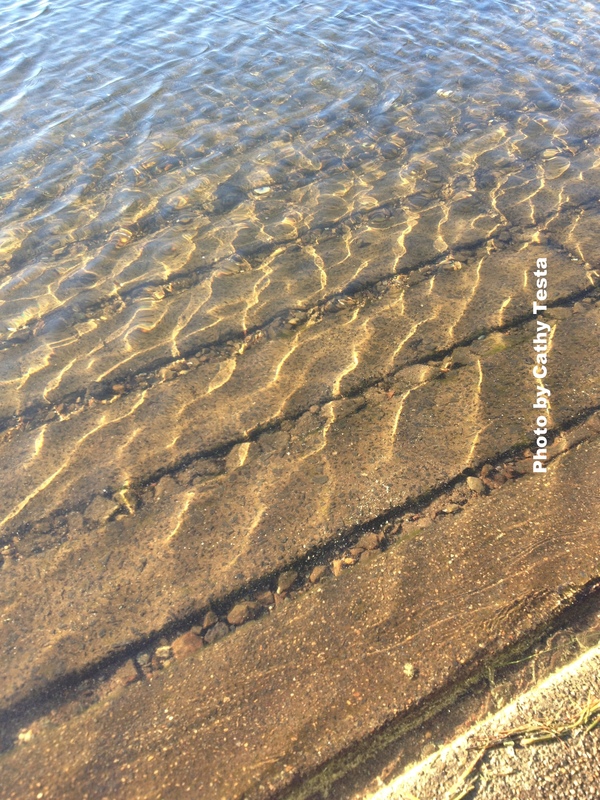 The road dips a bit and leads you to the public boat launch. A small parking area is available across the street for a few vehicles. In the mornings, it has been available but during busy peak season time, it may be impossible to find a spot. There is also a beach, called Sandy Beach (see below for information). 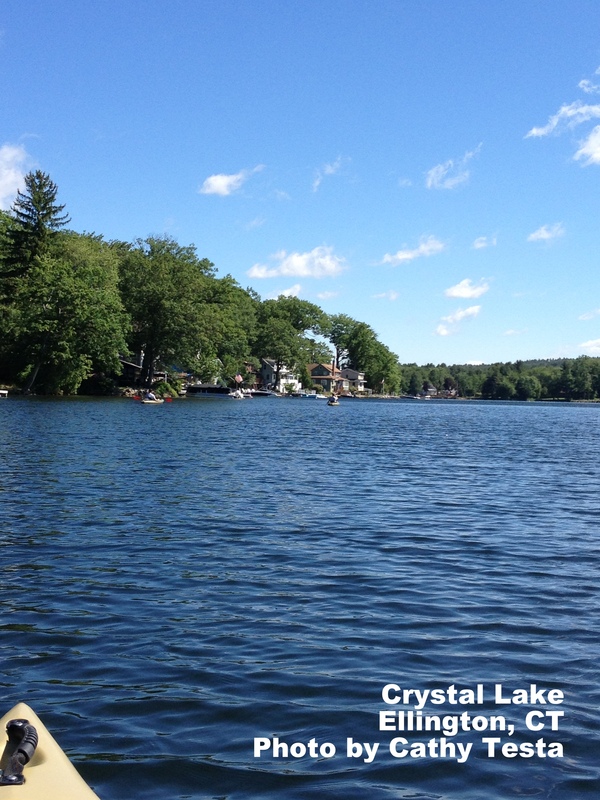 Crystal Lake Association can be found on Facebook here. Information on how to handle your boats to prevent spread of invasive species can be found here. 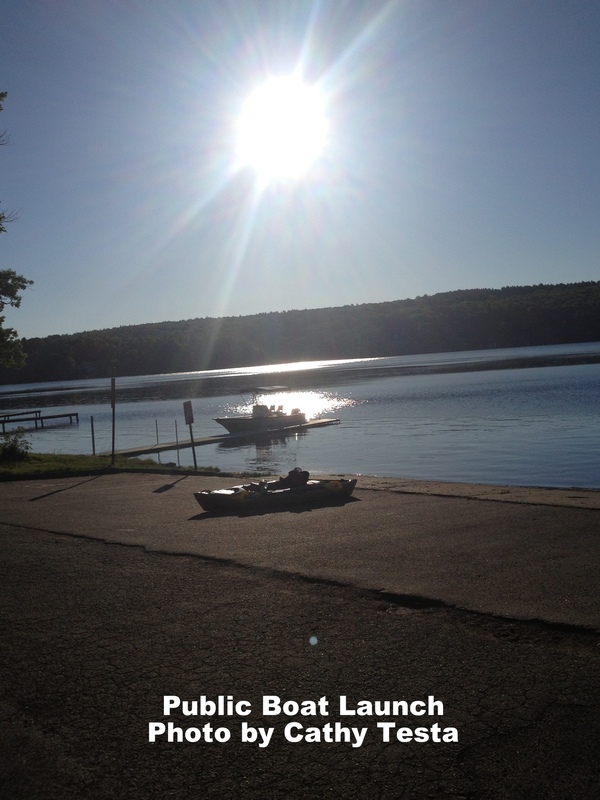 Safe boating practices for the lake can be found here. 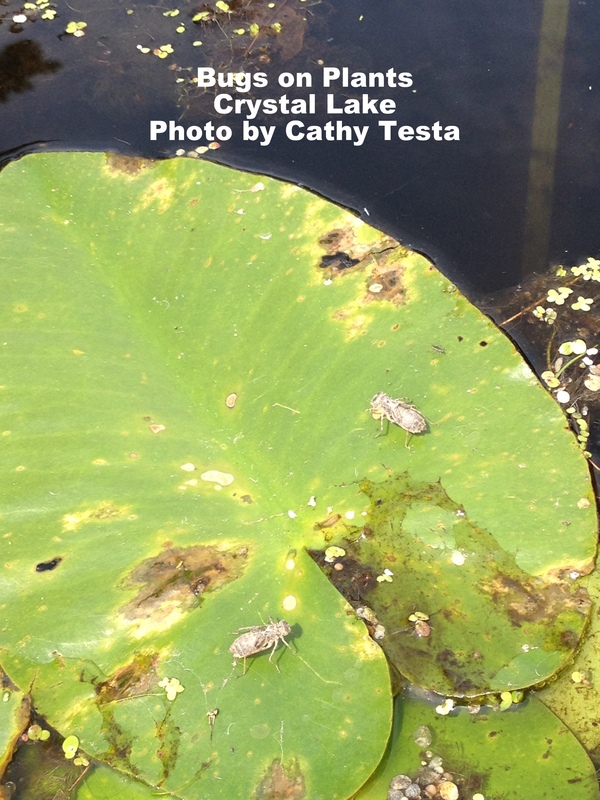 An Aquatic Plant Survey map for Crystal Lake can be found here. There are two outhouses in the parking area across from the public boat launch. Sandy Beach is located on Crystal Lake on Route 140 in the northern end of town. Our beach offers swimming and sunbathing opportunities on hot summer days. The normal operating schedule for the beach is weekdays from 12 noon to 6:30 pm and on the weekends from 11:00 am to 6:30 pm. Ellington residents may purchase seasonal passesfrom the Recreation Department at a cost of $40.00 per family (Ellington Resident), $25.00 per single (Ellington Resident), $10.00 per senior citizen (Ellington Resident) or enter the beach on a daily basis. Daily Fees: Ellington adult residents are $ 2.00, children 6 years and older are $ 1.00. Out of town guests are charged $ 5.00 per adult and $ 3.00 per child 6 years and older. All children 5 years and younger are free. 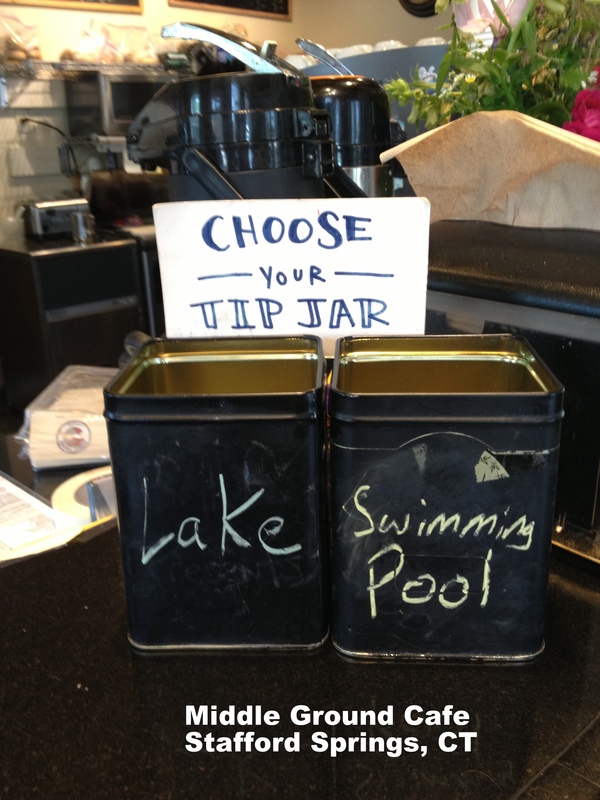 If you decide you would like to venture on some more after boating in the morning, Stafford Springs center has done a bit of revamping, and you can find some nice artsy shops and a wonderful coffee shop serving lunch in town, called Middle Ground Cafe. It is about 5 miles from the lake, continuing on Rt 140, until you hit the center of Stafford, which you will recognize with the brick buildings. Look for the cafe on your right, at 42 Main Street, Stafford Springs, CT, (860) 851-8900, http://www.middlegroundcafe.com. They offer great teas, coffees, and a mix of light lunch entrees and sandwiches. Stop into “The Chocolate Moose” at 72 Main after for dessert, and be sure to visit the quaint art shops. 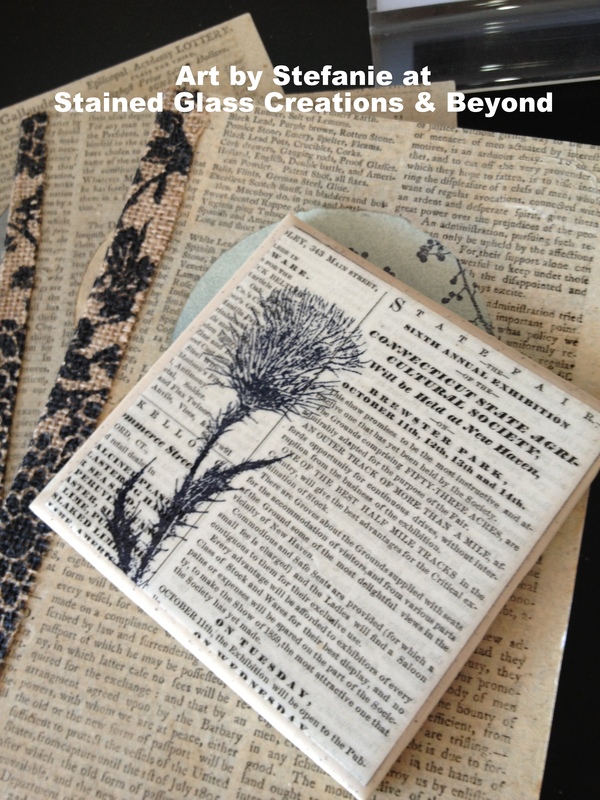 I bought some tiles at “Stained Glass Creations & Beyond” by “Art by Stefanie” across the street. Old newspaper prints related to agriculture with plant images stamped on them caught my attention. There were also some nice pottery items by other artists, hand-made soaps, jewelry, and paintings on the wall. P.S. I will be adding information to this post once I get my call back from the lake association on my questions about the invasives to share with you, and for me to learn more! Update: I heard from Mark Mickiewicz, President of the Crystal Lake Association. He said “the invasive plants grow from the bottom and rise to the surface, and they are trying to prevent power boats from going into those areas because it can cut the plants, detach, float, and repopulate into other cleaned out areas. They are asking to be “careful” and not to pull, cut, detach or damage the plants.” (Basically it is not strictly prohibited to enter for kayakers, but requested to stay out of the invasive cove areas if possible to prevent any spread, but some people do venture there to fish, etc.) For questions, call 860-875-1001. Your report on Crystal Lake is excellent. My wife and I are hoping to find a home somewhere on the lake ‘water front’ sometime in the near future as retirement approaches. I actually had trouble finding the lake as I kept mixing it up with a nearby lake that runs through Stafford Springs. Would you know who is best to contact regarding real estate sales. And again, thank you for the great research you have done.